Seville, the fourth largest city in all of Spain with a population just over 700,000, is quite diverse. Take a look at its handful of quirky, distinct and colorful neighborhoods, and you’ll see just how unique each area is. Each piece of Seville stays true to its Spanish roots and tradition – there is no doubting that. But each part is just a little different than the other, in the best way possible. Join us for any tour throughout Seville and we’ll show you the secrets buried within each barrio and, subsequently, the very best things to do in Seville. Before anything else, Seville’s city center is a must-see area of the city. Not only does it boast all of the major historical monuments like La Catedral de Sevilla and the Alcázar Real, but it’s also tucked just between two other important pieces of the city. You can spend lots of time in the center people watching and taking in the magnificent architecture, but when you’re ready to move on, you’ll have two options. On one side you’ll find the shopping sector of the city, the streets lined with popular shops like Mango and Zara, while if you head the other direction you’ll run right into Barrio Santa Cruz. The Santa Cruz neighborhood is Seville’s most picturesque area with its narrow, twisty cobble stone streets and whitewashed walls. You’ll see beautiful flowers in windows and patios as you walk by, and you’ll feel like every step you take warrants another photograph and that each corner holds a new surprise. And just across the river you’ll find the eclectic Flamenco-laden neighborhood of Triana. Once you cross the historic Puente de Triana (Triana Bridge), you’ll get a great view of the city from the other side of the river as you cross into a lively area full of crowded bars, impromptu Flamenco shows, ceramic stores and little mom and pop shops selling all kinds of goods. Along the river there are numerous bars offering outdoor seating and lovely views of the river and the bridge. If you stay in the neighborhood for dinner, you won’t be disappointed either – Triana has tons of different tapas bars, and if the weather’s nice, loads of seating outside on the main pedestrian street. 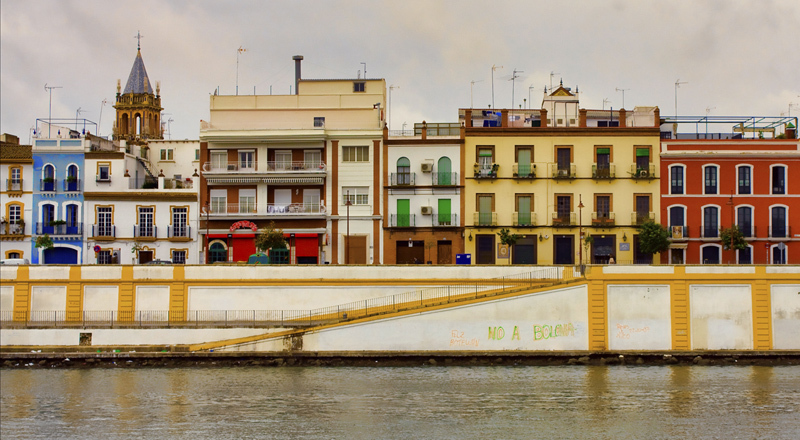 After spending some time in Triana, swing by El Arenal – the neighborhood located directly across from Triana on the other side of the river. This hip and posh area is full of modern bars and tapas restaurants, and it’s a lovely spot to stop for a late-night drink.Finally, on the other side of the historic center, is Alameda de Hercules, a huge open and oval-shaped plaza. Venture that way any time of the day and you’ll find delicious restaurants, hippie-filled tables and funky little offbeat shops around its edges. It’s a unique neighborhood and one definitely worth taking a stroll through on a nice day. Each of these pieces of the city make Seville the special place it is. Let us help you really delve into discovering the city and find Seville’s most impressive nooks and corners. With our many different guided tour options, you can visit any of these neighborhoods. You tell us where you’d like to explore, and we’ll help you find the neighborhood’s best-kept secrets.